Last month, supermarkets in the UK rejected 40,000 lemons because they were ‘too ugly’ to sell. This news comes at a time when the problem of food waste continues to worsen. Did you know, for instance, that the average UK household throws away a month’s worth of food every year? Or that within the EU, food waste is expected to rise from 89 to 126 million tonnes by 2020? Or that a third of food produced globally – 1.3 billion tonnes – gets wasted before it even hits the shelves? Or that fruit and vegetables sold in supermarkets must hit certain cosmetic standards like size, color, looks, weight and so on before they hit the shelves? No? Neither did I. 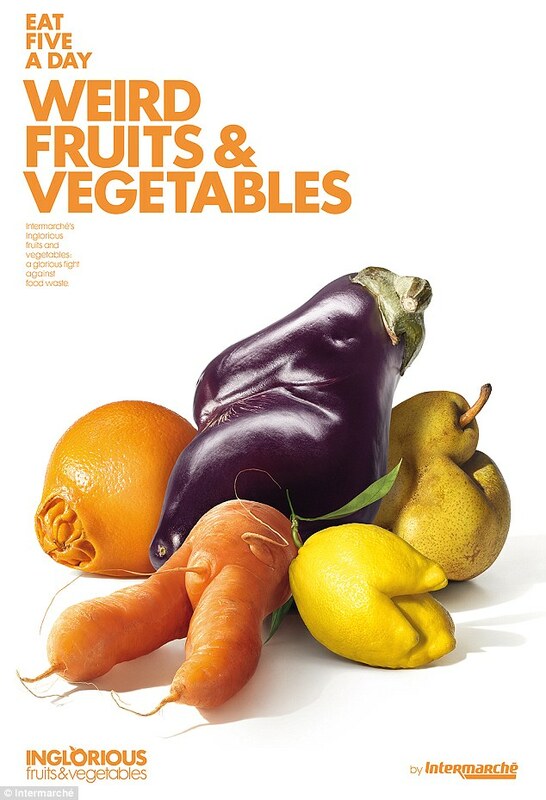 In 2015, the French supermarket Intermarché campaigned to change the way we think about ‘ugly’ foods. With slogans like “A grotesque apple a day keeps the doctor away as well” and “The ugly carrot in a soup, who cares?”, the campaign got to the heart of the absurdity of our obsession with perfectly formed food, and even resulted in a change in French law regarding supermarket waste. 'Wonky veg’ campaigns have been carried out this year by supermarkets in the UK too, along with the FareShare group who redistribute food waste to charities. In Denmark they've even opened up a food-waste supermarket. Despite these positives, I wanted to find out how I personally could make a change to my daily life to combat food waste. 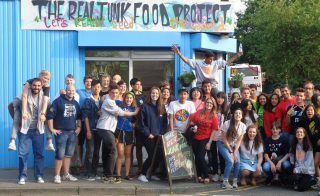 Then I came across The Real Junk Food Project in Leeds, (TRJFP) near to where I live. 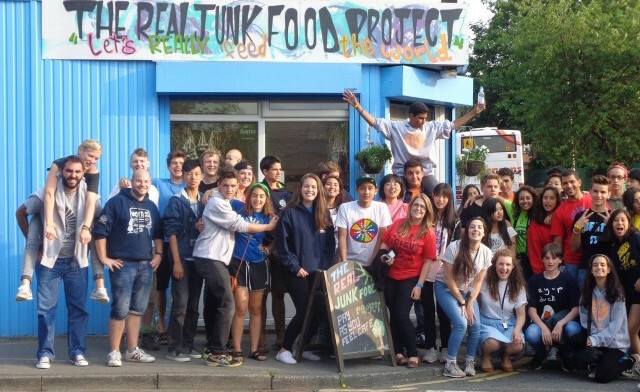 With their tagline of ‘let’s really feed the world’, TRJFP use 'waste food' in their café. Began in 2013, the project sources all of its ingredients for free from supermarkets, restaurants, and even food photographers, that would otherwise go to landfill. Founder, Adam Smith, established it as a ‘Pay As You Feel’ café, which means that customers pay as much or as little as they want, or can volunteer to pay for their meal. There are now 250 branches worldwide, all under TRJFP’s umbrella and business model. Do you think a food revolution is happening? large distances travelled What's this? unnecessarily and people’s diets generally. What do you mean by ‘people’s diets’? There’s been a habitual change in terms of people knowing more about salt/sugar etc.. But people are still very distanced from their food. For example, nitrogen is added to soil to enrich the vegetables, but this is very different from what our grandparents would just call a ‘vegetable’. Back in the day, they would have grown things organically, without fertilizers. It was more natural. Ah I see, so how does TRJFP combat issues like the nitrogen fertilizers then? Well, we have to work within the system. This is why we want to provide information for people to increase their knowledge. We don’t expect everyone to be able to change their lifestyles straight away, as most people don’t have the means to. But if they know a bit more about where their food comes from, and the nature of their food, we hope they’ll become more mindful in their consumption. The term 'supply chain' refers to the network of people, businesses, organizations and resources it takes to move a product from the producer to the customer. Also, the development of apps that connect restaurants to consumers in order to decrease food waste is where this innovative change is happening, at the end of the supply chain. However, it needs to be at the production stage, at the stage of growing the fruit and vegetables too. So, do you have any top tips for people wanting to take a more sustainable approach to their eating habits? Think meaningfully about what you eat - enjoy food more, take less for granted. Savor what you eat! So that’s at least three possible ways to tackle this problem. Firstly, those within the industry - like Intermarché and TRJFP - are taking positive steps, showing the way for others to follow. Secondly, as Josh mentioned, the rules of the game itself may need looking at. Regulations, like how far food can travel, could be revised. And so-called ‘cosmetic standards’ themselves could be done away with. Lastly, responsibility also falls to us, the consumers. Small changes, like keeping food for longer or buying only what we need could also help address the problem of food waste.